The usual pre-holiday frenzy – gifts, menu planning for the family meal, last-minute work – kept me from posting much, and the post-holiday hasn’t been much better. Now that I’ve unearthed the house from a mountain of snow and taken care of my horrible hacking cough (weasels caught in my lungs, or so I’d like to believe), I can get back to a regular update schedule. Because even when all that other stuff is happening, I never stop cooking. I had a slab of pork belly that I roasted in the usual manner for ramen, but was looking for something new to do with what I’d have left after the soup and some steamed pork buns. The Momofuku recipe for sam gyup sal ssäm, or pork belly ssäm, looked simple enough for me to put together in an afternoon, so that’s what I decided to do. 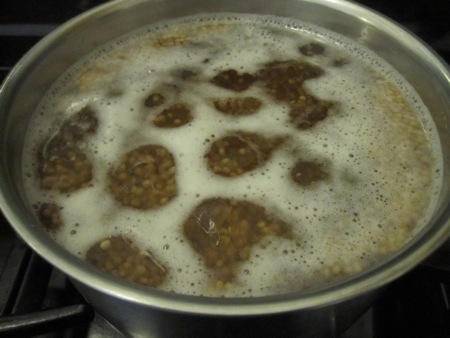 Of course, the simplicity of the main recipe was due to having two of the components broken out a separate recipes, which meant I had to start with the most basic component, pickled mustard seeds. 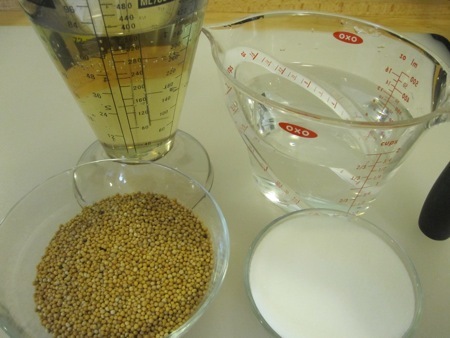 I assembled a cup of yellow mustard seeds, one and a half cups of water, one and a half cups of rice vinegar, and a tablespoon of kosher salt. I combined everything in a small saucepan and simmered over low heat for about 45 minutes until the seeds were plump and tender. Once the seeds had cooled, I stored them in the fridge until needed. 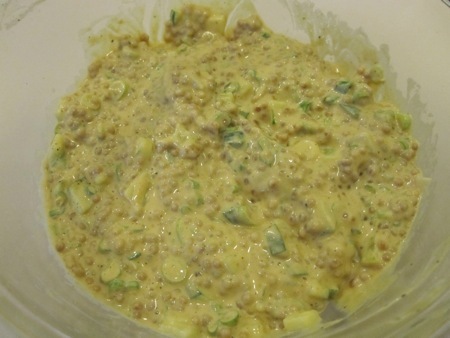 To make the mustard seed sauce, I used six tablespoons of the pickled seeds, three tablespoons of Dijon mustard, a tablespoon of Chinese hot mustard, three tablespoons of Kewpie mayonnaise, three tablespoons of thinly sliced scallions, and three tablespoons of diced quick-pickled cucumbers. I mixed everything together and let it sit in the fridge. 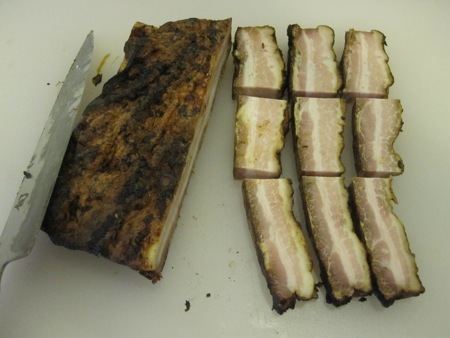 I cut three half-inch thick slices from my pork belly, then cut each slice into three pieces. 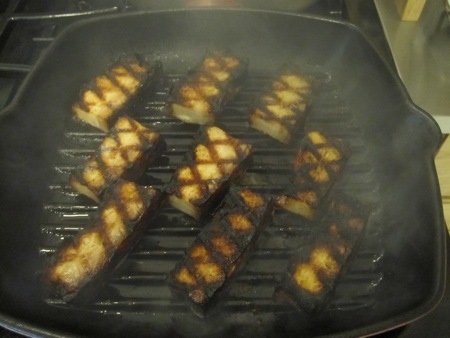 I seared the slices in a wicked hot grill pan, turning them to get cross-hatched marks. To plate, I served the slices with Boston lettuce leaves, the mustard seed sauce, and steamed white rice. Like the bo ssäm I made a month ago, the lettuce was a wrapper for the pork, rice, and sauce. Here’s where I confess that I don’t like mustard very much. I never add it as a condiment to burgers or hot dogs, and never serve it as a side with pork dishes. Used sparingly as a component of sauces and vinaigrettes is about as much mustard as I can stand, so I approached this dish with some trepidation, fearing that I would be overwhelmed by a mustard kick. I needn’t have worried. The pickled seeds were sweet, and the hot mustard had more of a wasabi-like bite to it than the vinegar-y mustard taste I expected. I also made a discovery that I think improves the dish: I had some pickled cucumber slices left over, which I added to the lettuce wrapper for extra crunch and salt. It may surprise you to learn that I don’t always have a slab of roated pork belly at the ready in the Belm Utility Research Kitchen, but I may have to make it a constant presence now that I’ve had this dish. I just found your blog through the nose to tail at home blog, and I’ve been hooked all day! fantastic work. Thanks for reading! Nose to Tail at Home is awesome; Ryan’s doing Great Work. I have a horrible feeling I’m trying to teach egg-sucking to my granny here since you know so much more about food than I, but… I don’t associate “mustard” and “vinegar” as flavours at *all* – except in the case of what the British supermarkets sell as “american mustard”, which is indeed deeply vinegary. Is it possible that this is a factor? 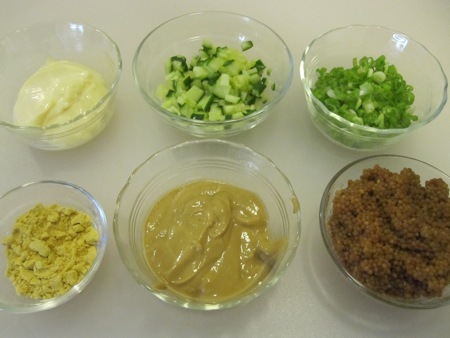 According to the label of a container of French’s yellow mustard – the stuff you’ll find in most American kitchens – the first ingredient is vinegar, the second is water, and only the third is mustard seed. I know it’s the vinegar that’s responsible for my dislike of prepared mustards, and not the taste of the mustard seed itself. Yes, it was French’s I was thinking of. The (supermarket own brand, grain-style) mustard I have in the fridge lists water, mustard seed, vinegar, salt in that order (and that’s all there is in it), and has only a very light vinegar note and much more mustard, which I’d say was typical of UK stuff. Something like a Colman’s English mustard doesn’t have any detectable vinegar to my nose – and traditionally would have been mixed from powdered mustard and water for the moment, though I bet few people do that now.